I have a been very inspired by flamingos lately. Are they the new owl? I don't know, but I love them. And I wanted one for our newly re-done entry. I have seen flamingos here and there in the last couple of months and I was very inspired by this flamingo by Sarah M. Dorsey (you can skip my whole process and go straight there for a free printable), and also by this flamingo on Smitten Studio. I took these pictures last fall at the Copenhagen zoo, thinking I could turn them into artwork somehow. They ended up not working for this project, however. I didn't get a strong enough pose. The one on the far left was a contender for a while, though. So instead I bought a stock photo of a flamingo. It was 5 credits for the large size, which translates into about 8 dollars, depending on which plan you are on. I use the pay-as-you-go plan. Next, I did an online search for some brushes or filters. And I found this incredible free resource: PsykoPaint.com. I created an account and pulled up my flamingo image on their art board. Then I tried some different brush styles. I love their Cezanne brush, but there are several to choose from incl Monet and Van Gogh in the Style drop down. I followed the direction of the feathers on the flamingo as I was using the brush. Here is another one I played around with, with the Monet brush (I think. Maybe a mixture of different ones. It was so much fun). B commented on this one: "Well, that isn't very good Mom" LOL.... ahhh all the critics. Ok, in all fairness, I did ask him what he thought because I actually value his opinion. Except that one... ...kidding. I actually liked that one too, but I ended up going with the Cezanne one - a more subtle approach. Here is the one with the Cezanne brush. I liked that it made a purple line on the beak. I pulled it into Photoshop and cleaned up some of the "over spray" on the brush, but not all - especially around the beak, added the eye back in and oomphed up the color a bit. If you spend more time in Psykopaint, than I did, you would not have to do that. There is also an undo button. Then I decided to crop it so the flamingo would have more of a presence and take up more canvas space and be bigger. I made it ready for print by leaving 2 inches all the way around the canvas for a gallery wrap. You can see where it would wrap below on the right. My actual file did not have lines on it of course. That would look weird. I made my print 20 x 28 inches finished size, so my file was 24 x 32 inches to account for the gallery wrap around the edges. 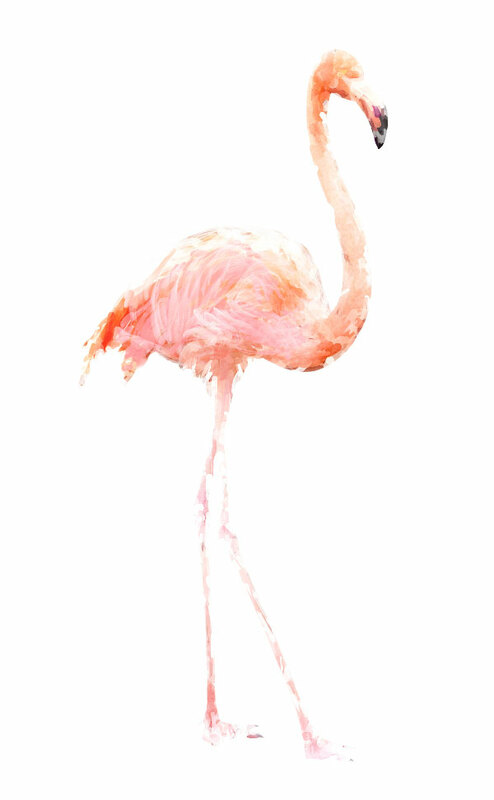 Then I ordered up my Flamingo print at an online canvas print source. I had even found a great deal that I wanted to share with you, but when it came in, the print was just not ... great. Not even good. The material it was printed on was thin and plastic like and you could see the wooden frame through it. The white in the print had a purple hue. Me < -- not happy. This company was SO great through, they had really helped me out and shipped fast and done everything they could and I SO wanted to recommend them to you, but the product just didn't measure up. Sad face. Their customer service was AWESOME and I got a full refund, so that was great. But check out the close-up of the canvas print. I love that texture. I can't wait to make some more artwork in Psykopaint some time. What a great tool. This is not a sponsored post. I just like to pass on great finds like this one! See all of the entry hall. 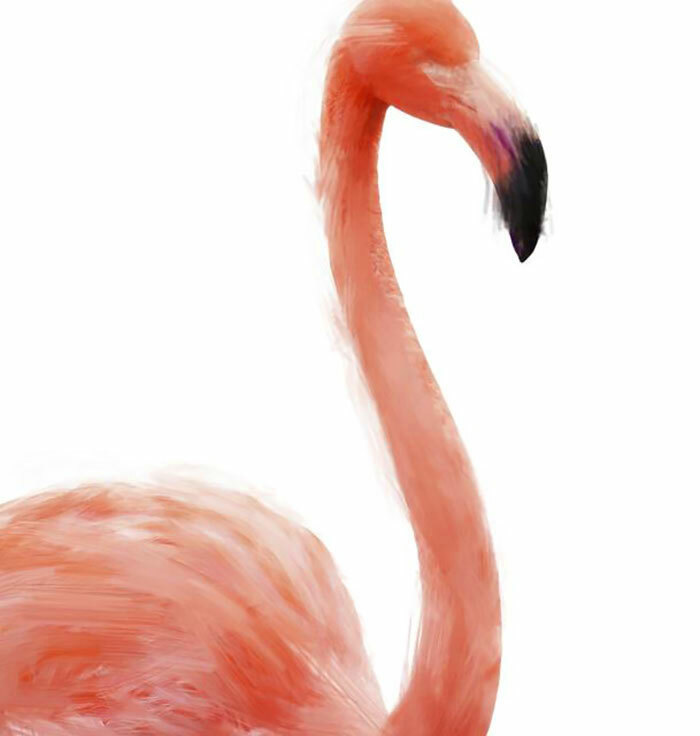 This article: Flamingo art made with Psykopaint - a free resource first appeared on http://ahomefordesign.com.